Blueberries are great because they have fewer pests than most of the other fruit trees and shrubs. The key to their success is making sure they are grown in acidic soil. With varieties as small as 6" high, they can be grown in any size garden or planted in containers. Vaccinium spp. There are many different species of blueberries. The zones vary based on type. Blueberry bushes are round and can grow anywhere from 6" to over 10' tall, and 2' to 15' wide, depending on the type. Depending on the type, the leaves may be deciduous or evergreen. The small flowers appear in spring and are shaped like bells. They may come in white, red or pink, and may have some green also. Blueberries are very rich in antioxidants and other nutrients. Fruits are ripe shortly (1-3 days) after they have turned completely blue, approximately 60-80 days after blooming. There should be no red on the blueberry. Highbush. Northern highbush grow in zones 4-7. Southern varieties grow in zones 7-10. Grows on tall bushes that are 6-8 feet high. Lowbush grows in Zones 3-6. As the zones suggest, these are very good for cold places. These grow only 6-18" high. They have underground runners. Half-High mixes the benefits of highbush - large fruit - with the benefits of lowbush - cold tolerance. Rabbiteye grows in Zones 7 to 9. These can grow over ten feet tall. Perfect for use in locations with acidic soil. Keep out of windy locations. Be sure to add blueberries to your harvest garden. The most important thing to know about suitable soil for blueberries is that it should be acidic, with a range of 4.5 to 5.2. You will likely need to change the soil pH, so have your soil tested. Otherwise, blueberries prefer sandy loam soil that is well drained. If you have clay soil, add in organic matter. Place a layer of mulch around the shrub after planting to help stifle weeds and protect the roots from heat. Water your blueberries regularly. They should receive about 1-2" of water per week. In order to make the plant stronger and more productive, pick off any flower buds that appear for the first 2 years after planting. This will encourage the plant to work on the roots and branches (canes). Blueberries are self-pollinating, but for the best fruit production, plant more than one variety. Prune your blueberries every year. For years one and two, you only need to worry about removing any dead or damaged branches (called canes). 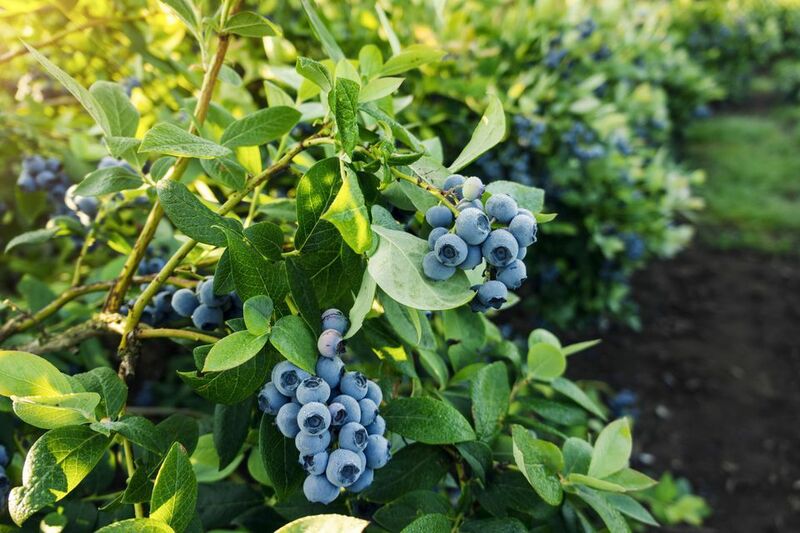 For lowbush blueberries, cut part of the shrub completely down to the ground every 2 or 3 years. Prune any dead or diseased canes. Once a cane is six years old, remove it, as they do not produce well after this age. By that age, they are usually thick with peeling gray bark. Look at the rest of the canes. Leave the ones that are growing long and strong with many buds. Per the Maine Cooperative Extension: "Leave six to seven vigorous two- to five-year-old canes and two or three one-year-old canes per bush. A mature blueberry plant should have six to 10 healthy canes varying in age from one to six years old." Blueberries are susceptible to blueberry maggot. There are sprays and traps available to control them. Other occasional pests may include blueberry stem borer, cranberry fruitworm, cherry fruitworm, Japanese beetle, leafroller, leafhopper, and aphids. The other common pests are birds who love to eat the blueberries. Netting can be used to keep the birds from eating the fruit. The most common disease is blueberry mummy, caused by a fungus. Other diseases you may find sometimes on blueberries are Botrytis blight, Anthracnose, stem blight, rust, Phytophthora root rot, Phomopsis twig blight, Fusicoccum canker, shoestring disease, stunt, scorch virus, and bacterial crown gall.